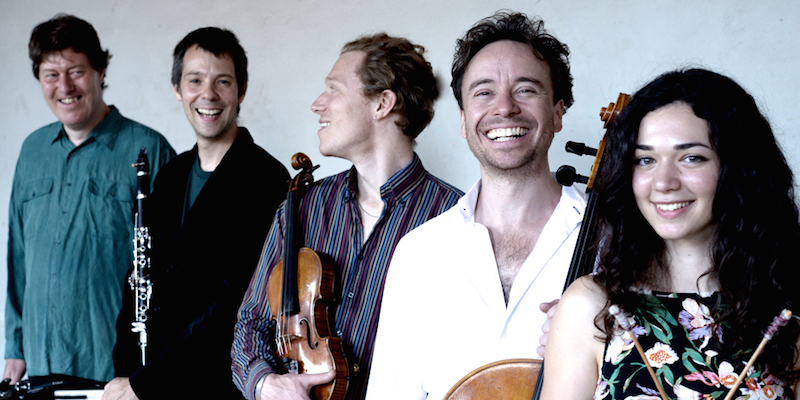 ZRI (from left: Jon Banks, Ben Harlan, Max Baillie, Matthew Sharp, Iris Pissaride): Blending Schubert with folk melodies from Hungarian pub tunes, Jewish klezmer dances, shepherd melodies from the Carpathian mountains and an improvised wedding lament. 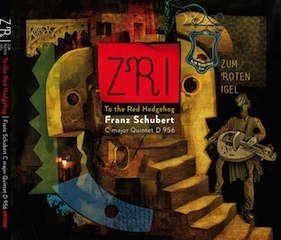 ZRI (Zum roten Igel), named for the major concert venue in Vienna, has followed up its 2014 disc of Brahms (Brahms and the Gypsy: Clarinet Quintet op. 115) with a similar treatment of Schubert’s C Major Quintet D956. So we have Schubert’s quintet re-orchestrated for the London-based ZRI line-up (Ben Harlan, clarinet/bass clarinet; Max Baillie, violin; Matthew Sharp, cello/baritone; Jon Banks, accordion; Iris Pissaride, santori) interspersed with traditional folk-melodies. It all sounds rather unlikely–why on earth would you need to re-orchestrate Schubert’s divine quintet, and what has it got to do with Hungarian gypsy tunes? Quite a lot, as it turns out. 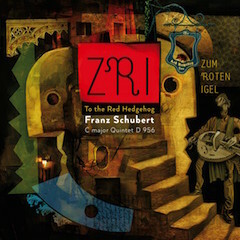 Zum roten Igel (The Red Hedgehog) wasn’t just the name of the concert venue, it was the name of the tavern behind the venue as well–the tavern where classical musicians would go to carouse and to listen to the Hungarian gypsy folk musicians, the tavern next to which Schubert lived and where Johannes Brahms was known as a regular customer. This intoxicating mix, the fluidity of the genres, is what ZRI seeks to evoke. Schubert’s contemporaries would have heard these folk melodies regularly and been able to detect them and their influence in classical music, just the way we can listen to music and hear the contemporary resonances in it. Without a sense of the music around at the time, it is difficult for us. So ZRI blend Schubert with folk melodies from a variety of traditional European backgrounds, including Hungarian pub tunes, Jewish klezmer dances, shepherd melodies from the Carpathian mountains and an improvised wedding lament. These folk melodies don’t just come between the movements, they are inserted into them as well. So that the first part of the opening Allegro ma non troppo flows into Cristinel si Iulian Turturica, which then flows back into the second half of the Allegro. And not just folk melodies: Der Leirman from Schubert’s Winterreise (sung by Matthew Sharp) appears between the Trio of the third movement and the return of the Presto. The re-writing of the Schubert for an ensemble that includes an accordion and a santori (a type of cimbalom) really brings out the hidden folk influence of the Schubert. When listening to the disc you have to pay careful attention; there are moments in the quintet that sound like pure klezmer here. The re-orchestration has been sensitively done, and the players really bring out the beauties of Schubert’s music in its new guise. But it also a wonderfully unlikely but intoxicating mix that succeeds in evoking the idea of Schubert coming home from the tavern (and he lived next door at one point) humming a tune that appears, in a different form, in his latest piece. The quality of the music making really makes this disc, as the players are able to move from serious Schubertian intensity to Hungarian gypsy passion and back again without even drawing breath. They make the disc an intoxicating mix, so that it works on multiple levels. On the one hand, it helps tease out Schubert’s folk influences, twinning moments in the quintet with folk songs, and bringing out the folk feel of Schubert’s writing. On the other hand, it is simply great fun to listen to, the sort of inspired mélange you could imagine the musicians at Zum roten Igel coming up with. 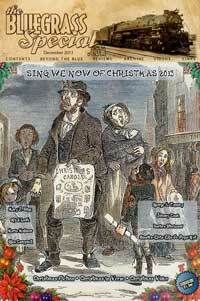 Reprinted by permission of Robert Hugill, a contemporary classical composer based in London. Recent performances of his works have included sacred motets, orchestral music and a one-act opera. 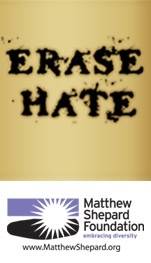 Click here for his full biography. For more of Mr. Hugill’s classical reviews and interviews, visit Planet Hugill—A World of Classical Music. Congratulations to Robert Hugill for Planet Hugill being named as one of Feedspot Blog Readers’ Top 25 Opera Blogs & Websites.